Kyon's sister is Kyon's grade school sister (what else, right?). Her name is unknown, just as how Kyon's full name is unknown to the audience. Others refer to her only as "Imouto-chan". A five word summary of her would be, "Loli in appearance and behavior," which means a bright, cheerful girl of short stature, befitting of her young age. She does the typical things younger sisters do to annoy a big brother, such as forcing him to wake up when he just wants that extra five minutes in the morning. 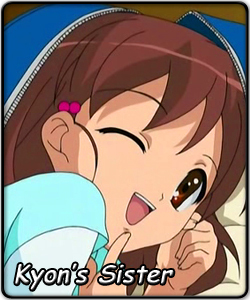 Her role in the show is quite limited with very few lines, even though her greatest contribution is probably the nickname for her brother, "Kyon." After she started using the nickname in front of Kyon's friends, they started calling him so too. She is sometimes used by Haruhi to fill in extra numbers for some of the SOS-dan's activities, such as being a player for their baseball team. Shamisen the stray cat was adopted by Imouto-chan after being used in the SOS-dan "movie". She seems to be more occupied with Shamisen after its adoption, which is convenient for Kyon - except when it wanders into his room, which often leads to her bursting in to look for it. The anime-adaptation of Lone Island Syndrome, where the SOS-dan goes to an isolated island with a mansion to witness a mysterious murder act, decided to include Kyon's sister for extra screentime and better story telling. The infamous "Loli in a Bag" scene was when she snuck into Kyon's bag in an attempt to join the trip; the anime let her come along whereas she wasn't allowed to in the novel. She gets along with Mikuru very well and inquisitively interacted with the ever silent Yuki.